"Hey Cliff," I hear you saying, "I just saw the new Captain America movie and I would love to know more about where all of this Winter Soldier stuff comes from. Can you help me?" Relax, fearless reader, I got your back. In 2004, a writer named Ed Brubaker wrapped up his exclusivity contract with DC Comics, and was a free agent again. He walked into Marvel's offices and they asked him, "What do you want to do?" He told them he had a pitch for Captain America. He detailed it out. They said "It's all yours." Keep in mind, this is 2004. The "Iron Man" movie wouldn't come out for another 4 years. The Disney buyout of Marvel wouldn't happen until 2009. Marvel was just starting to regain its footing, and Brubaker's run on Captain America was one of the biggest lynch pins in that, following in the footsteps that Brian Michael Bendis had been doing with Daredevil (springboarding off of the relaunch that writer-director Kevin Smith had given it in 1998). 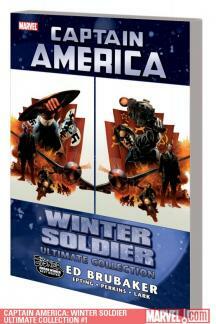 Brubaker would write Captain America for eight years, wrapping up his run in October of 2012. The most recent series has been written by Rick Remender and it's, well, it's no Brubaker, let's just leave it at that. I realize Remender is trying to do something radically different, but, hell, I don't think I really wanted something radically different. So, here's the thing - Captain America is a tough nut of a character to crack, much in the same way that, say, Superman is, but for different reasons. With Superman, you have the "overwhelming force" problem. Part of Superman's schtick is that he's basically power without limits. That means to tell interesting stories, you're limited in the kind of tales you can tell - Superman grapples with the morality of his overwhelming powers versus the common man, Superman copes with being an outsider, or Superman's powers are reduced and/or he finds a foe as strong as he is. There's only so many times the kryptonite card can get played before readers go "this again?" And it's hard to relate to Superman, because, well, he's got more power than we're really even able to comprehend. We as an audience are more likely to relate to shy Clark Kent than we are Superman. Captain America had a similar problem in the Marvel universe, in that there were a limited number of stories people could really tell with him - Captain America's classic "man out of his own time," the world's changed, the burdens of leadership and the pressures of not fitting in. For much of the 1990s, the idea of Captain America even seemed antiquated, awkward, because what did the idea of "America" even mean? Mark Gruenwald (who wrote the incomparable "Squadron Supreme") tried to make Cap a relevant character, having him deal with political and social issues, but it still just didn't seem to work. They tried getting Rob Liefeld to make Cap popular again (as part of the disastrous Heroes Reborn event) but it just didn't connect. In the aftermath of 9/11, Captain America revealed himself as Steve Rogers in the Marvel Universe, and the Avengers collapsed. Rogers joined S.H.I.E.L.D. And that was about where Brubaker came in. 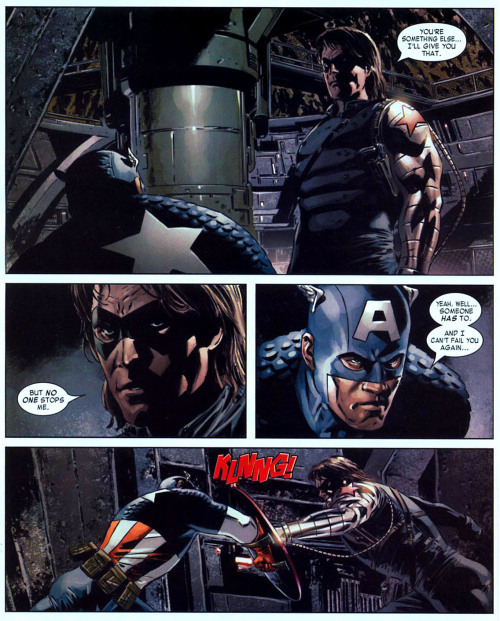 See, Brubaker's pitch was that he wanted to do two things - he wanted to tap into the sort of 1970s paranoia that was highly relevant to today's modern political/espionage landscape, and he wanted to bring Captain America into the modern age, not by struggling with it, but by trying to figure out not just what he meant in this new world, but what the idea of being Captain America meant. He wasn't going to take the boy scout approach that so many writers had taken with Captain America, but wanted to really evaluate what sort of image a person who bore the name "Captain America" and who had fought in World War II would have of the country he resided in now. It was time for Captain America to stop living in the past and start adapting to the present, all the while struggling with old foes and adversaries from his past who had already adapted to the modern age.